What Blessed Pope Paul VI said spontaneously to a Redemptorist gathering, in 1973. 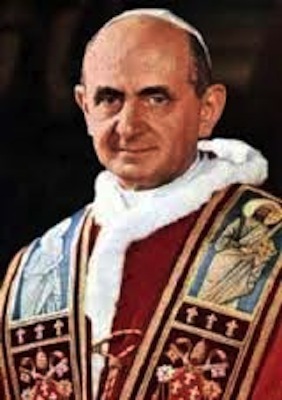 Recently, Pope Paul VI was declared ‘Blessed’, or beatified. It was he who was the ‘helmsman of the Second Vatican Council’, guiding it to its completion in 1965. Years later, in 1973, he met with a group of Redemptorists who were gathered in Rome for the General Chapter of the Redemptorists. After reading his prepared text, he laid it aside and spoke ‘from the heart’ to those present. Fortunately, one person was able to record his words, which have been a great encouragement to Redemptorists in all the parts of the world where we work. The text of his words has been made available to us again, after his being declared a Blessed of the Church by Pope Francis. First an extract from it, and then, below, the full text of what he said. And here is another thing we cannot pass over: it is the expression of our gratitude for the work you are doing in the Church, above all, for your care of souls, which ever since the time of St. Alphonsus, is your primary vocation. This nearness to the people… try hard to strengthen it. If we want to save the world we have to instruct, we have to give good example, we have to pray; but we also have to unite ourselves to the people by being in the midst of them. We have to come as close as possible, even personally, to the classes which today are, as it were, the most “distrustful” of religion. They are the most numerous, and they are the most powerful, because by reason of modern democracy, they have in their hands the governing of the lives of the peoples. Be among the people, get as close to the people as you can. Won’t that be enough in Latin? When one’s heart is so moved, as ours is at this moment, at the presence of these dearest sons and friends and brothers now visiting us, and when one’s mind is conscious of the function and vocation you have in the Church and in the world, we cannot keep back what we feel on such an occasion as this. First of all, know that we have a great affection for your religious family, a great regard for it… We place great confidence in you. Be assured that you are loved by the Church, and especially by this Apostolic See, which, though we don’t merit it, at this moment we have the great honour actually to represent. Know well, too, that you are genuinely united to us. It has been very well said in your name: “Faithful to our tradition, we must feel that we are solidly united with the Church of Rome, with the Chair of St. Peter.” Very well, feel assured that this is reciprocal …the Chair of Peter, the Church of Rome is united with you; it wishes you well; it esteems you; it is grateful to you. Then we are grateful to you also, because you exercise one of the great, if not one of the greatest, means at the disposition of the Church’s ministry, and one we want to recommend to you very much – spiritual direction. Like St. Alphonsus, be really good confessors. We need them so much. Just yesterday, during a conversation with another ecclesiastic, we were talking about the way things were going in the Church, and the well-known scarcity of religious vocations, and we were looking for the reason. Well, the cause is this: guidance is no longer given in the confessional, there is no longer any spiritual direction. A candle, we said, does not light itself. One candle that is lit must pass on its light to the one next to it. The priest must communicate his own vocation, his own enthusiasm at being called to serve the Lord, to another youthful life still lacking experience of it, but capable of recognizing and accepting the call. You can certainly multiply the forces of the Church and console her in one of her gravest necessities, by sitting patiently and using your wisdom and knowledge – as is characteristic of the Redemptorist Fathers – in the confessional, celebrating the Sacrament of Penance and giving spiritual direction. Become really specialists in this field of ecclesiastical science, in this field of Moral Theology. Strive to be really qualified and genuinely balanced students and authors in it. You know the crisis through which Moral Theology is passing in the Church, that is, the crisis of relativism, which holds the possibility that Moral Theology can change – just as man’s customs change, and society changes, and theories that govern the world change, so too even the Law of God, of which we must be the interpreters. This relationship between man and his fellowmen, which Moral Theology codifies and expresses – all this can be submitted to critical, even radical examination, especially on some point where the observance of the Law of God, confirmed by the Church, becomes hard and difficult. Have great confidence in the teaching authority which guides all of us, because all of us are disciples of the Chair of Christ who is our Teacher. And when the principle is stated, when the law is established and is clear in what it demands, and in the possibility of its being observed and applied to the necessities of men – then become Pastors. That is, find a way of making the matter understood – a Theology of Language. See how you can be modern – A Theology of the Times. See how you can understand the society in which we live – I would call this a Theology of the People. These are all flexibilities of pastoral theology; to be pastors is to add love to the knowledge we possess. And love has so many resources – on the one hand, the power to convince, and on the other hand, to make easy the carrying-out of an obligation. Be good pastors. As we said before, get close to souls in the sacred ministry, especially in the hearing of confessions, and you will find out how much indulgence is necessary, how much, I would say, “elasticity” the Law of God itself is capable of assuming, for the very purpose of adapting itself to the weaknesses and requirements of man’s human condition. Courage! As we have said in our short discourse, take your vocation very, very seriously. It is a tremendous and unique grace that God has granted you, to be committed by your dedication in the religious life to the service of God, and also to the service of the neighbour of the people of our time. Attach great, great importance to this choice which God has made of you. It is not an event, just like any other; it is not a happening like any other. It is a secret which rests over and influences your whole life, and truly makes of you true ministers of the wisdom of the Gospel and of the grace which Christ has given in inheritance to His Church. And to give you a sign of this affection of mine for you, and of my fidelity, I promise to say Holy Mass especially for your Congregation. Now I give you my blessing. And then I shall come down among you for a photograph to commemorate the occasion. ← Death of Fr. Stephen McCabe, Redemptorist.